Italy is a must-see destination for anyone who studied art history. A full third of UNESCO’s world artistic treasures is crammed into this peninsula, and for this reason guidebooks and tours in Italy focus on sculptures, paintings, frescoes, and the occasional Notable Building. But Italy (and Perugia in specific) is much more than simply artwork. Buried under mountains of commentary on vaults and brushstrokes are little stories and anecdotes that are not only amusing but also may help a student anchor a particular historical event in their head better than learning dates. 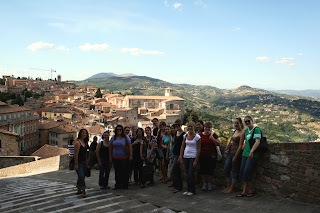 This weekend Umbra staff member Zach Nowak did his “Perugia Nooks and Crannies” tour with two groups of Umbra students. This guided walk around the center went down the main corso of the city but also ducked into the back allies, where Nowak showed students the former city orphanage with its revolving baby-leaving door. Students also heard about Perugia’s battle with the Pope in the Salt War, heard some not-often-recounted stories about Saint Francis, and found Perugia’s only remaining fascist symbols. An encore presentation of the tour will be held in several weeks.